Karen Braun-Munzinger, Zijun Liu and Arthur Turrell. If a boat is unstable and someone jumps out, does it capsize the boat for everyone else? In a novel application of agent-based modelling, we examine how investors redeeming the corporate bonds held for them by open-ended mutual funds can cause feedback loops in which bond prices fall further, posing risks to financial stability. In our model, reducing the speed with which investors pull out their investments over time helps to keep prices stable and remaining investors’ savings on an even keel. Since the financial crisis, the corporate bond market has changed considerably. There has been strong growth in intermediation by mutual funds. The assets under the management of corporate bond funds have more than doubled since the 2008 financial crisis. At the same time, concerns about the fragility of fixed income markets have grown. Despite the market being larger, there are worries that there has been a reduction in market liquidity, so that large orders have more of an effect on prices. Open-ended funds are a type of investment fund which allow investors to redeem their bonds for cash at any time. These funds account for 11% of global assets under management, including bonds and equities. The fundamental mismatch in liquidity between the bonds themselves and the cash that investors can redeem their bonds for at short-notice can have consequences for financial stability, some of which were explored in the Bank of England’s December 2015 Financial Stability Report. 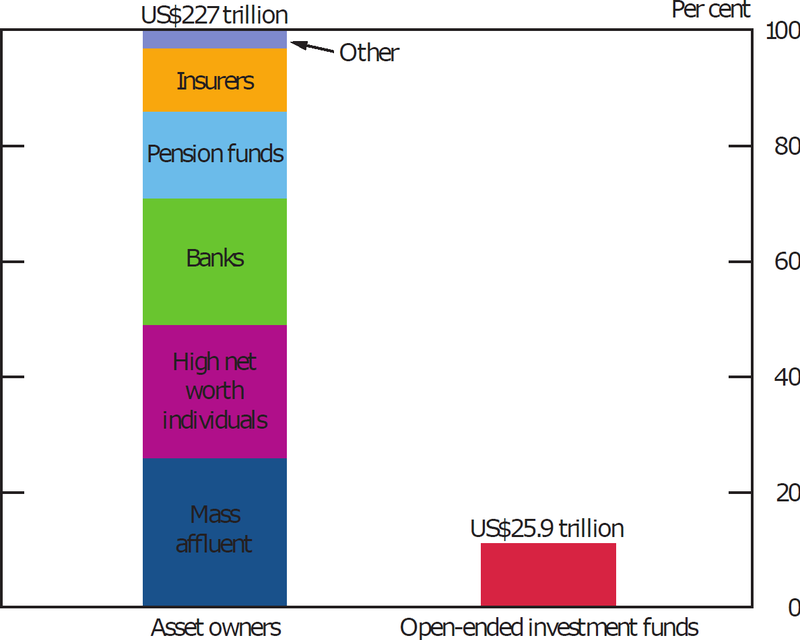 Figure 1: The split of global assets by owner in 2012. Source: BlackRock, McKinsey Global Institute analysis and Bank calculations. Other includes sovereign wealth funds, foundations/endowments and family offices. For example, if interest rates were to rise, corporate bonds might become less attractive and redemptions could take place as some investors pull their wealth out. Investors who redeem their bonds first get a good price when funds sell them, but poor liquidity may cause bond prices to fall. These price falls could prompt remaining investors to redeem their bonds too, so that funds have to sell off more bonds and prices fall even further. A feedback loop of redemptions takes place in which wealth is destroyed and those who make the initial redemptions enjoy a first-mover advantage. The scenario we explore in our model is how a shock to funds’ expectations about the fraction of companies that will fail in a given year, also known as the expected loss rate, initiates one of these feedback loops. If funds expect more companies to fail, they are likely to demand higher yields from bonds to compensate them for this – so a sudden change in the expected loss rate pushes down on prices. The steps in the feedback loop are shown below in Figure 2. The colours in the feedback loop indicate the different market players we consider; funds, the market maker, and the investor pool. To explore how these feedback loops occur, we created an agent-based model of trading in the corporate bond market that allows us to simulate how the yield of bonds responds to market shocks. The full results have been published in a Staff Working Paper. In the model, the agents are the individual funds whose decisions are simulated. The agent-based approach has been in use in the natural sciences from the 1950s to the present day. Agent-based modelling has been applied to everything from particles to people and is becoming more popular in economics. Applications include bank bail-outs, endogenous growth, and systemic risk. We chose the agent-based approach because it is particularly good at modelling complex non-linear feedback effects. A stylised picture of our model can be seen below. We have a representative pool of investors, a single market-maker through which all trades are made, and three distinct types of fund. In the model, the combined effect of trading by one-thousand funds of all three types is simulated. 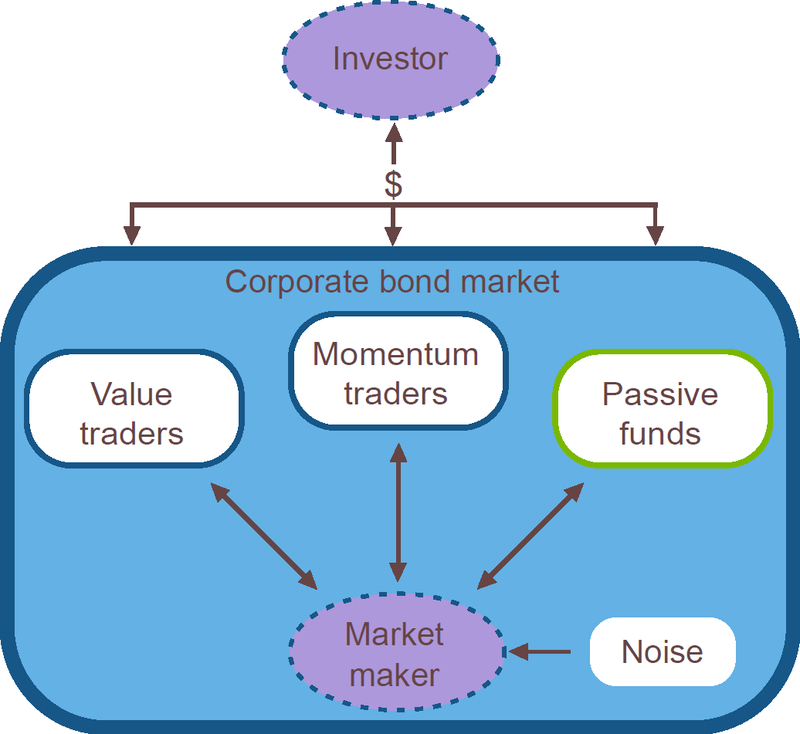 The behaviour of the investors is based on an estimate of the empirical flow-performance relationship found in the Bank of America Merrill Lynch US corporate bond index. The market maker sets prices based on the excess demand for bonds. The funds behave differently depending on what type of fund they are. Value traders believe that bonds have a fundamental value, so they buy when they believe bonds are undervalued and sell when they are overvalued. Momentum traders ‘ride the market’: they buy if prices are rising and sell if prices are falling. Passive investment funds invest a fixed fraction of the wealth they manage in the bonds. These three types of traders are common in agent-based models. The model is calibrated against post-crisis data from the US investment grade corporate bond index. This includes calibrating the way that investors respond to performance, the sizes of funds, and stylised facts associated with returns on bonds. The distribution of daily-log price returns from both the data and a single run of the model are shown below. The model replicates much of the variation in returns except in the tails of the distribution: this is because the empirical data includes macroeconomic news but the model run shown does not. Feedback loops can be prompted by many types of economic shock. 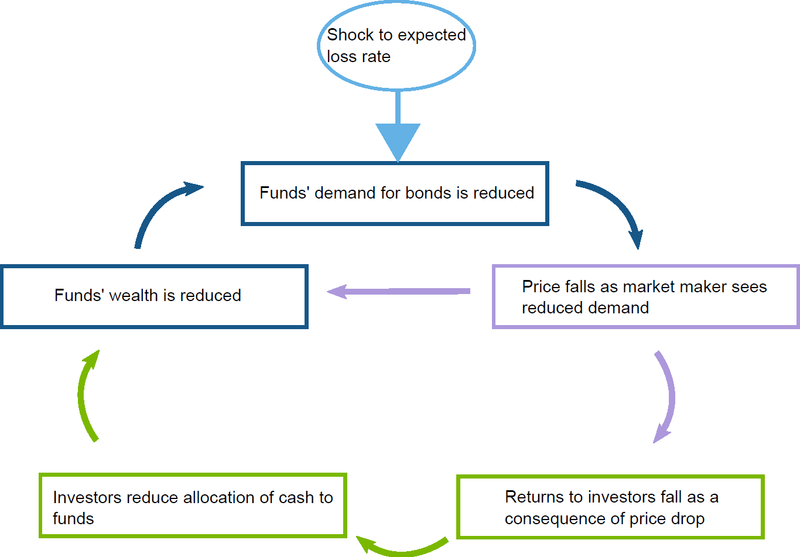 An example, shown below, demonstrates the feedback loop which happens when funds’ expectations about how likely bonds are to default (the loss rate) changes. As price and yield are inversely related, a sudden increase in loss rate causes the price to drop and the yield to rise. The shift to a loss rate of 0.35% per annum is approximately what occurred during the 2008 financial crisis. The yield response shown in Figure 5 is the median of 100 simulation runs. This smoothes out some of the noise, so that the results are much more regular than in a single simulation run. Initially, yields increase as value traders rebalance their portfolios, with momentum traders following the increase in yield. Eventually, the yield overshoots what value traders believe it to be worth, so they begin to buy again, reversing the yield increase. Momentum traders now intervene in the opposite direction, pushing yields down further. These events contribute to the swings which eventually settle to the new stable yield. The behaviour of investors contributes to how yields, and prices, change after a shock. Some investors respond to poor performance by making redemptions, which mean that funds have to sell off more bonds for cash to give back to the investors. When bonds are illiquid, this pushes down prices further, meaning that remaining investors’ wealth is reduced. So redemptions can increase the maximum size of yield dislocation following a shock, further impairing market liquidity. The amplification of shocks to asset prices poses a risk to financial stability and efficient markets more generally. Sharp falls in asset prices may lead to losses at banks and other financial institutions at the core of the financial system. Overshoots in corporate bond spreads may unnecessarily reduce the ability of some companies to service refinanced debt or deter them from making investments. In extreme scenarios, the supply of credit to the real economy could be impaired by sustained financial market illiquidity. 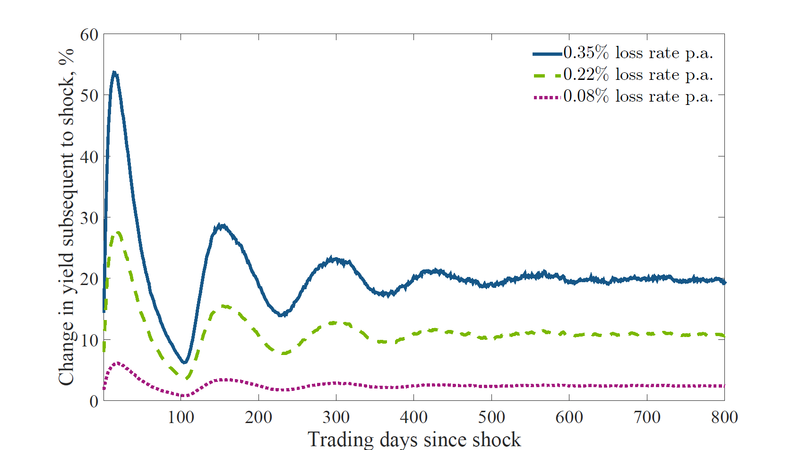 To find out how the speed with which investors make redemptions affected the dislocation in yield following a shock, we ran simulations in which redemptions were split over 20 trading days rather than taking place on a single trading day. We then compared the maximum dislocation in yield for redemptions over a single trading day versus redemptions over 20 trading days. The model suggests that when funds spread sales of bonds over a longer period, the strength of the wealth destructing feedback loop is reduced. This is shown in Figure 6 below by the reduction in the maximum change in yield when redemptions are spread out. The percentage shown on the y-axis is the change in the maximum yield dislocation, while the x-axis shows the post-shock expected loss rate. Normal investor flow corresponds to investors’ response to performance in the post-crisis period. It was around twice as high during the crisis. Investor flow characterises how much wealth investors remove from funds when returns are negative (or how much wealth they put in when returns are positive). A doubling of investor flow would mean investors withdrawing twice as much wealth given the same negative return on their investment. 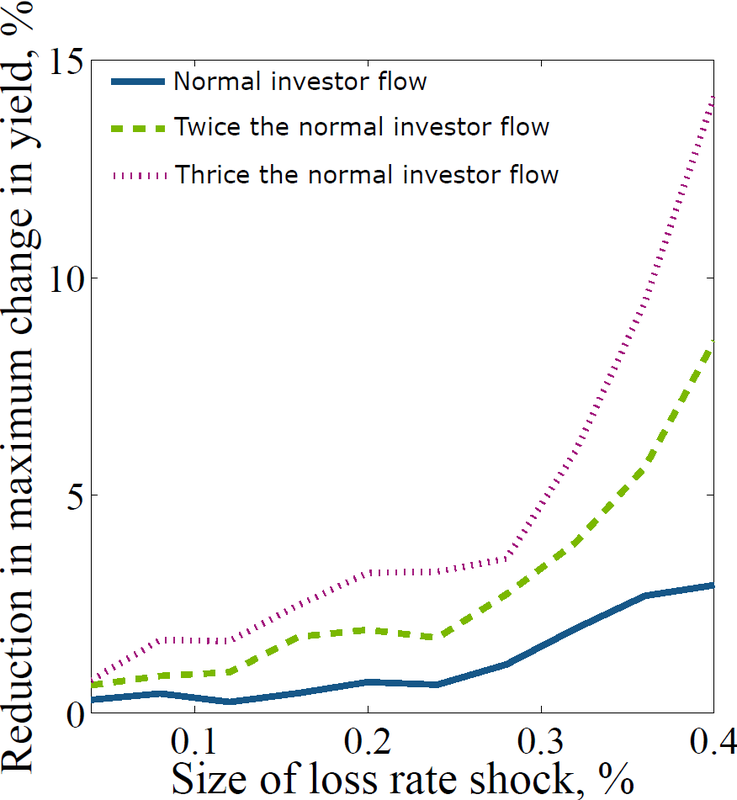 The figure shows that when investors are more inclined to respond to poor returns by taking their wealth out of the fund, redemption spreading is more effective in reducing the change in yield. So the overshooting effect is reduced more when investors are more sensitive to performance. The agent-based model gives an insight into how the wealth-damaging loops which follow shocks to fixed income markets with limited liquidity proceed, and what can dampen them. Spreading redemptions over longer time periods has little effect when shocks are modest and only a limited effect in normal times. 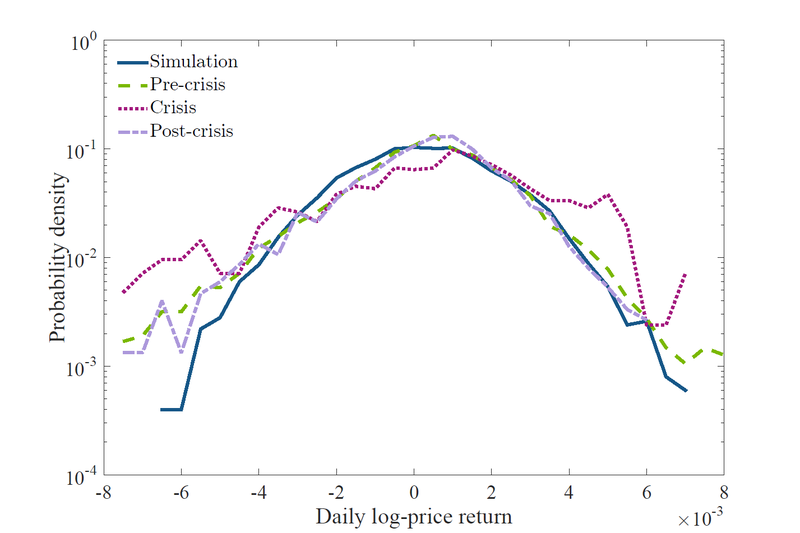 But the model suggests that in times of stress, when investor flows are more strongly dependent on fund performance, spreading redemptions over several trading days can significantly reduce the impact of shocks. Karen Braun-Munzinger worked in the Bank’s Prudential Policy Division, Zijun Liu works in the Bank’s Capital Markets Division and Arthur Turrell works in the Bank’s Advanced Analytics Division. Previous Post Should the true costs of insuring deposits of up to £75,000 be made clearer?